If the locals laws for the same are not specified, the title is to be transferred in a time limit of three months from the date of the issuance of the Occupancy Certificate (OC). 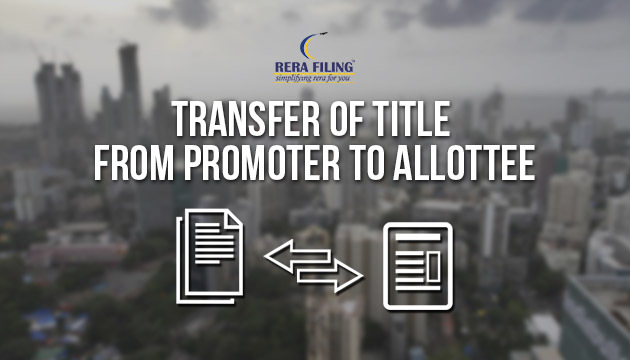 the possession of the same to the allotee and the common areas to the association of the allotees, in a real estate project and the other title documents pertaining thereto- within specified period as per sanctioned plans as provided under the local laws. the Indian Government which clearly and specifically demarcates the rules and regulations that must meticulously be adhered to otherwise the trespassers are subjected to punitive actions. RERA( Real Estate Regulatory Authority) 2016 is a stirring law passed by the Indian Government which clearly and specifically demarcates the rules and regulations that must meticulously be adhered to otherwise the trespassers are subjected to punitive actions. * Execute a registered conveyance deed in favour of the allotee along with the undivided proportionate title in the common areas to the association. * This should be followed by handing over the possession of the same to the allotee and the common areas to the association of the allotees, in a real estate project and the other title documents pertaining thereto- within specified period as per sanctioned plans as provided under the local laws. Thus, we conclude that the promoter is obliged to transfer the title in the name of the allotte as per the local laws. It is only the truancy of the local laws that a time limit of three months after the issuance of OC has been assigned.